Containing Tomato extracted water and Tomato ingredients, this multi-functional massage & pack brings instant magic vitalizing effects into the skin. 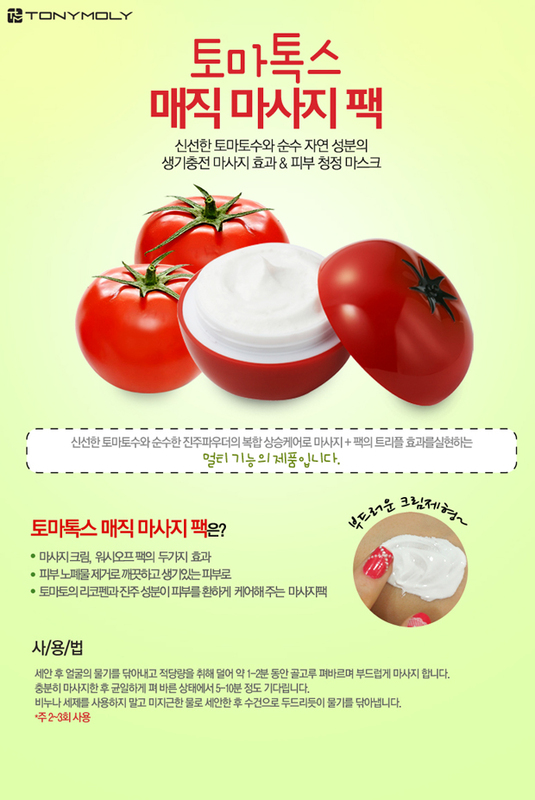 Being as a multi-functional product of soft massage & clearly wash off mask, Tomatox magic massage pack delivers highly vitalizing, truly clarifying, skin hydrating and protecting effects to the skin, leaves the skin amazingly clear and supple. After washing and towel drying the face, take an adequate amount of the product and softly massage with finger tips about 1-2 minutes. After massage, leave it as a mask pack for 5-10 minutes. Then gently wash the face in a patting motion (do not rub hardly).